Seasonal Overview Page Features are available in 12-month increments for $3,500 per feature. New this year, DMO and CVB partners will have the opportunity to be highlighted for the year on one of VisitNC.com’s seasonal overview pages. The feature will include a hero photo, headline, description and call-to-action to visit your website for more information. The seasonal overview page is linked directly off the Visit North Carolina homepage for several months at a time and is discoverable all year long. 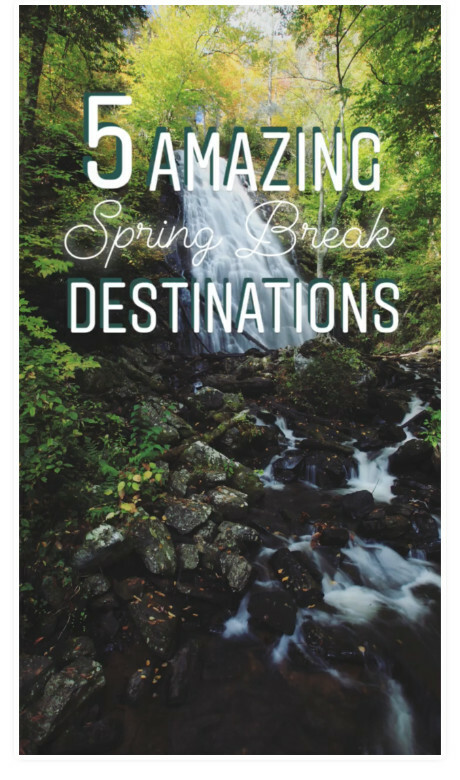 It holds all season-specific content, including a photo gallery, overview paragraph with links to seasonal stories, trip tips and a grid of relevant listings, events and stories. The average overview page receives approximately 25,000 page views per calendar year. Partners can purchase one (1) seasonal overview page feature per year max. Material Requirements: you will be required to submit a high-quality hero image, headline, placement copy and a downstream URL. Native Advertising opportunities are available in three-month increments for $500 per placement. Inventory: Five (5) partners per content page (see below for available pages). 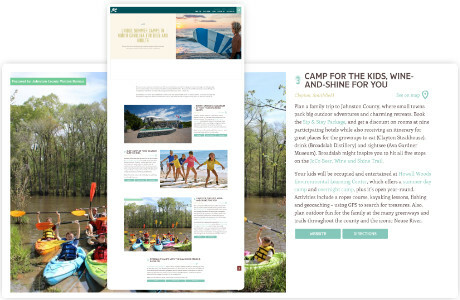 Native advertising on VisitNC.com allows partners the opportunity to buy into pages of VisitNC.com where their short-form native ad can appear within the site’s existing content grid. Native ads are designed to fit in with the overall look and feel of the site and will only appear within content relevant to the ad, making for a seamless user experience. Each content page will be open to a maximum of five partners on a first-come, first-served basis, in which all participating partners will receive equal share of voice. Upon investing in a single content placement, a partner will run for three months based on a start date of choice. Partners can invest in multiple flights and multiple placements, as inventory allows. Material Requirements: you will be required to submit a 400 x 400 image, a 50-character headline and a downstream URL. Brochure Listings are available in 12-month increments for $300 each. 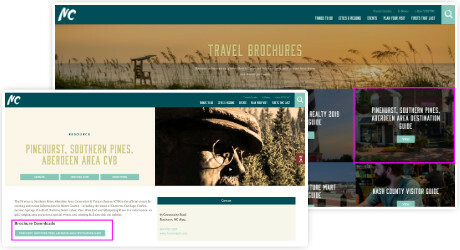 Partners can now add up to four brochures to VisitNC.com, where they will live on the Brochures page as well as on the partner’s individual listing. Brochures can be switched out quarterly or as needed by the partner. Material Requirements: you will be required to submit a PDF of your brochure (under 4MB) or a link to an online brochure / travel guide and a hi-res destination image. Video Listings are available in 12-month increments for $300 each. 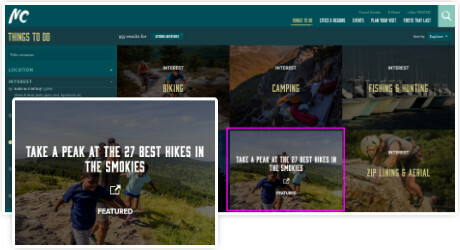 Partners can enhance their standard listing on VisitNC.com by adding up to four videos, which provides potential visitors with more engaging content. Videos can be switched out quarterly or as needed by the partner. 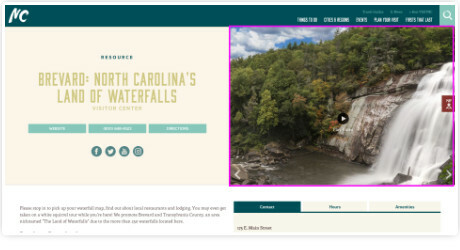 Visit NC may also use partner videos within editorial content on VisitNC.com. To be considered for this added value opportunity, your video must be high-resolution and shot in the past five years, two minutes or shorter, and relevant, helpful and / or entertaining to visitors. Videos that primarily focus on one person talking, are TV commercials, or have an overtly sales-focused messaging will not be considered. Material Requirements: you will be required to submit a YouTube or Vimeo link to your final video. Featured Events are available in 30-day increments for $150 each. 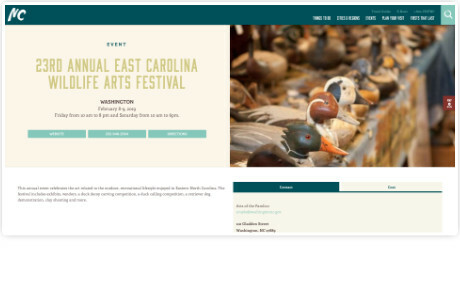 Participating partners have the opportunity to call more attention to their events and festivals via VisitNC.com’s Featured Event listings. This continues to be a cost-effective opportunity for partners to provide timely event information to potential visitors and attendees. Featured Events also receive valuable placement in Visit North Carolina’s bi-weekly Events E-newsletter distributed to more than 41,000 subscribers. Partners also have the opportunity to include event-related video to further captivate visitors at no additional charge. Material Requirements: you will be required to submit all event details along with a hi-res event image (must be horizontal, at least 1000 x 1000 pixels; stock photos, event fliers, logos or images with text on them will not be accepted). Featured Event Social Promotions are available for $500 each (this includes a 30-day Featured Event listing on VisitNC.com, valued at $150). This opportunity allows partners to gain increased traffic and engagement to their Featured Events. 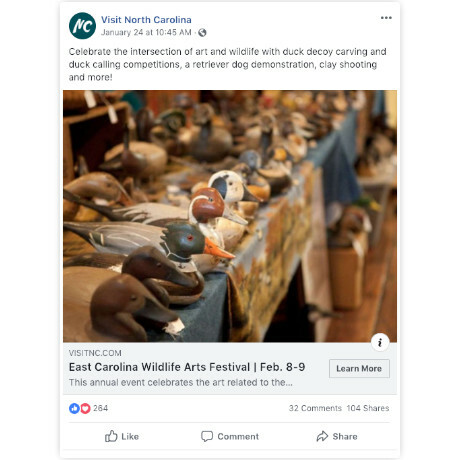 Visit NC’s Social Media Manager will create a Facebook dark post about your event that links back to your Featured Event listing on VisitNC.com. Dark-posting allows Visit NC the ability to zero in on the target audience partners are looking to attract to their events in the most cost-efficient manner. Material Requirements: you will be required to submit all Featured Event materials as outlined above in addition to a separate event image sized for social media (1200 x 628 pixels) and social targeting information. 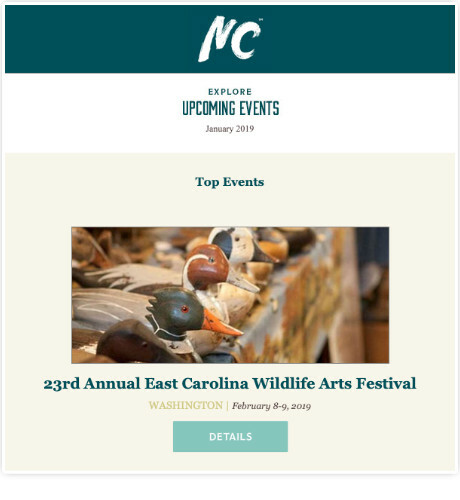 Featured Event E-newsletter Spotlights are available for $500 each (this this includes a 30-day Featured Event listing on VisitNC.com, valued at $150). Partners can sign up for one of two spots in each of the Events E-newsletters where their event will be spotlighted for maximum exposure. Travel Deals are available in 60-day increments for $250 each. 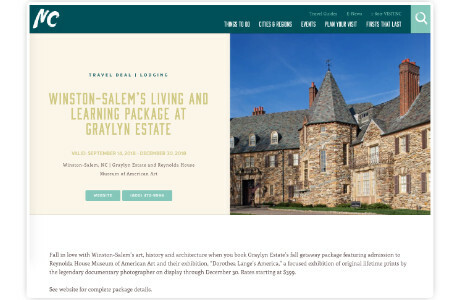 Participating partners are able to promote special North Carolina travel offers and packages to interested visitors on VisitNC.com. Travel Deals are featured on a dedicated page on VisitNC.com and within relevant content throughout the site. Partners will also be included in a monthly Travel Deals E-newsletter distributed to more than 42,000 subscribers. Material Requirements: you will be required to submit all deal details along with a hi-res image (must be horizontal, at least 1000 x 1000 pixels; stock photos, fliers, logos or images with text on them will not be accepted). Travel Deal Social Promotions are available for $600 each (this includes a 60-day Travel Deal listing on VisitNC.com, valued at $250). This opportunity allows partners to gain increased traffic and engagement to their Travel Deals. 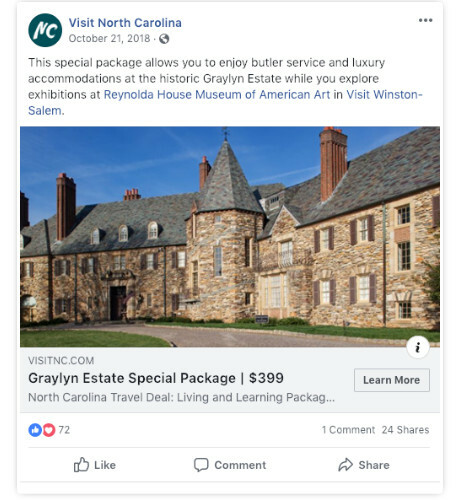 Visit NC’s Social Media Manager will create a Facebook dark post about your deal that links back to your Travel Deal listing on VisitNC.com. Dark-posting allows Visit NC the ability to zero in on the target audience partners are looking to attract with the deal in the most cost-efficient manner. Material Requirements: you will be required to submit all Travel Deal materials as outlined above in addition to a separate deal image sized for social media (1200 x 628 pixels) and social targeting information. 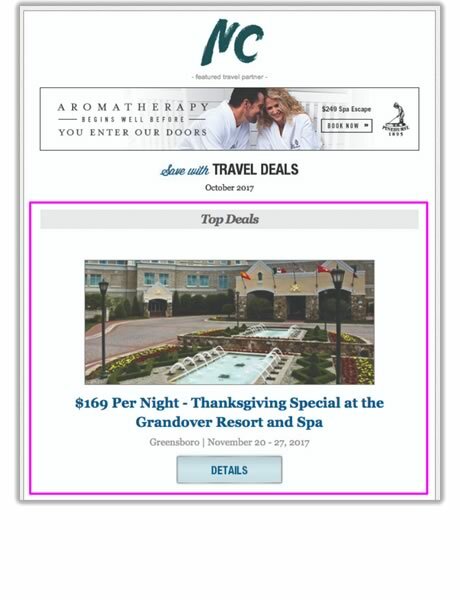 Travel Deal E-Newsletter Spotlights are available for $600 each (this includes a 60-day Travel Deal listing on VisitNC.com, valued at $250). Inventory: Two (2) Partner Spots Per E-newsletter. Partners can sign up for one of two spots in each of the Travel Deals E-newsletters where their deal will be spotlighted for maximum exposure. Thank You Email Sponsorships are available in quarterly increments for $350 each. 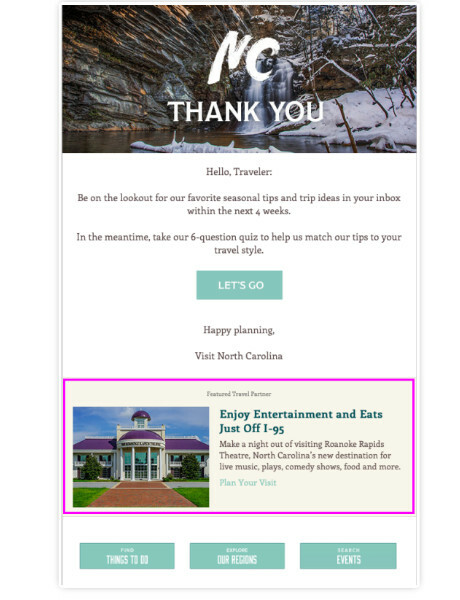 This opportunity allows partners to be included in a Visit NC auto- trigger thank you email that is received by people who have just ordered a North Carolina Travel Guide or signed up for a Visit NC e-newsletter on VisitNC.com. This native-style ad will allow partners to generate brand awareness alongside Visit NC content and messaging to an already engaged audience. The partner ad will include a click-through URL, so users will have the opportunity to learn more about the partner destination. Reporting will be provided at the end of each quarter. Partners can purchase one (1) Thank You Email Sponsorship per year max. Material Requirements: you will be required to submit a 20-character headline, 100-character ad copy and a hi-res destination image at least 800 pixels wide. 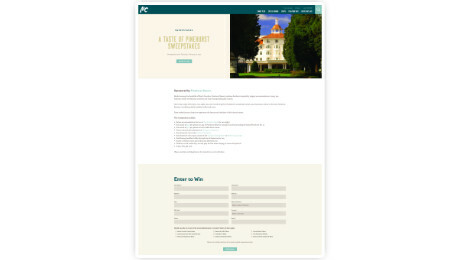 Homepage Sweepstakes are available in 1-month increments for $3,500 plus the travel prize package. Partners can purchase one (1) Homepage Sweepstakes per year max. Material Requirements: you will be required to submit a prize package that includes lodging, dining and attraction / activity passes as well as sweepstakes copy points, a hi-res destination image and logos for each of the participating sweepstakes partners. The Custom Content Program is available for $4,000 per partner. 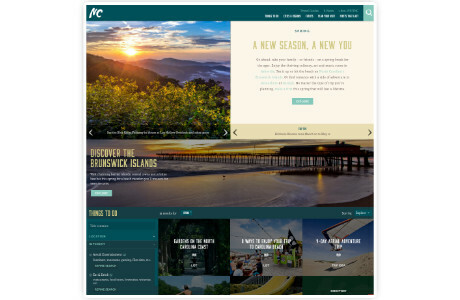 Visit North Carolina is offering partners the opportunity to work with our content team to develop custom content to be published on VisitNC.com, which can also live on your website. Your custom content will be written by the Visit NC team based on collaboration with you on the desired content and key messages to cover, and you will maintain joint ownership of the content with Visit NC. The new content will be promoted on Visit NC’s social channels with at least three (3) posts. Partners can purchase one (1) Custom Content Program per year max. Material Requirements: you will be required to provide an outline / bullets of content topics to include in your article as well as hi-res images to accompany the story. Featured Content Sponsorships are available in 12-month increments for $875 each. Visit NC is offering partners the opportunity to sponsor a portion of content specific to their destination within a seasonal or thematic story on VisitNC.com. Sponsoring partners will be able to provide suggested content for their portion of the article and the Visit NC content team will develop the final paragraph about the sponsoring partner destination into the larger story. The sponsored section will have a “Sponsored By” tag and will include one downstream link to an applicable partner site as well as a relevant image, which can be provided by the partner. Partners can purchase one (1) Featured Content Sponsorship per year max. Material Requirements: you will be required to submit an outline / bullets of content topics to include in the article as well as hi-res image options to accompany the feature. Native Instagram Story Placements are available for $250 each. 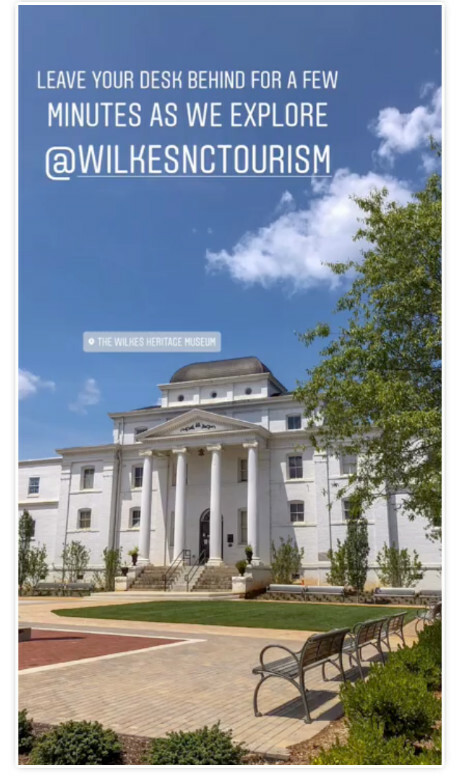 New for 2019-2020, partners now have the chance to take advantage of the organic reach and engagement of Visit NC’s successful Instagram Story content programming in an introductory setting. Visit North Carolina stories receive an average of 55,600 impressions with a 12.08% engagement rate. 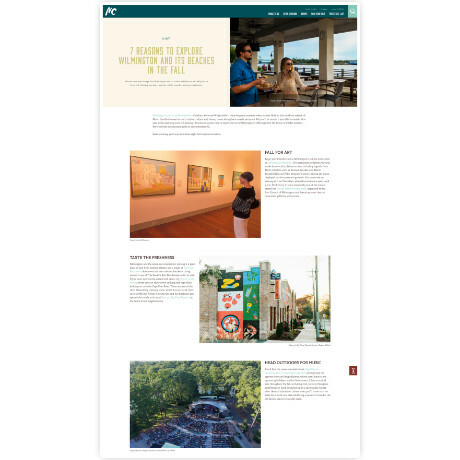 Participating partners will be featured as one slide in a larger themed editorial Instagram Story for a native feel with the added benefit of a swipe-up opportunity to your listing or custom content piece on VisitNC.com. Partners can purchase one (1) Native Instagram Story Placement per year max. Material Requirements: you will be required to submit one high-quality vertical image or video (sized to 1080 x 1920) and suggested copy points related to the story theme. Instagram Story Features are available for $850 each. Visit NC partners will again have the ability to provide content for our social media team to develop an Instagram Story that will be featured from Visit NC’s account. Instagram Stories are Facebook’s answer to the rise of short, quick content. Though content disappears after 24 hours, views are intentional and more valuable than large, but empty impressions. Each viewer of an Instagram story tapped through to be there and often taps back for a second look (both numbers we can track). In 2018, Visit North Carolina engaged users more than 2.39 million times with an average engagement rate of 12.08% across organic and partner program content. According to RivalIQ, the median brand engagement rate on Instagram is 1.73% across industries. Partners will be responsible for providing Visit NC with high-quality content (images and videos). Once the content is received, our team will develop the assets into a story, adding text, captions and other fun features to make it social media-friendly. Stories will go live on an agreed-upon date between Visit NC and the partner and will last for 24 hours. Reporting will be provided to the partners following the feature. Partners can purchase one (1) Instagram Story Feature per year max. Material Requirements: you will be required to submit high-quality social content (images and videos; sized to 1080 x 1920), information about the destinations featured and any applicable Instagram handles or hashtags. Social Media Spotlights are available for $3,000 each. Partners are also responsible for lodging, dining and activity expenses and will be invoiced following the Spotlight for these expenses, if incurred. This opportunity offers partners robust presence on Visit North Carolina’s social media channels (390,000+ followers) to leverage our passionate and engaged follower base to specifically feature your area. How does it work? We’ll work with you to determine content to feature that will inspire potential visitors to plan their own trip. Then, our team will travel to your location to gather spotlight content for social media use and plan posts for a two-to-three-week period that will feature your destination across our social channels. Potential Visit North Carolina channels for inclusion would be Facebook, Twitter and Instagram. Minimum 60-day lead time required for travel planning purposes. Partners can purchase one (1) Social Media Spotlight per year max. Material Requirements: you will be required to submit ideas for the spotlight itinerary.